Case Checkweigher - Model CSW-Mini | Packaging Distributors Inc. The CSW Mini Checkweigher is the most compact version of the CSW Series “End of Line” Checkweighers to fit in the most space restricted layout. As with the CSW and CSW Wash Down, the CSW Mini includes case holdback, weighing, and reject functions. Product is transported to the CSW Checkweigher from an upstream conveyor. A Next Case HoldBack Mechanism assures that only one case is on the weigh platform at a time. In the past, designers used a separate sequencing conveyor for this purpose, but those designs added considerable overall length to the line. Once the back edge of the product is detected by a photocell, the platform lifts the product off the conveyor after a preset delay. At full up position, the weigh platform enters a short delay to allow the load cell signal to settle. The advantage of this sequence is that the CSW Checkweigher machine weighs only the product, not the conveyor. Weight accuracy is measured to within grams and maximum speed is up to 30 cycles/minute. The product is either accepted or rejected after the weight is measured and compared to an over/under weight which is part of the product recipe entered through the touchscreen operator interface. If the product is within weight tolerance, it is allowed to proceed down the production line. If it is out of weight tolerance, it is automatically removed from the packaging line by the reject mechanism which is built on the side of the CSW Checkweigher conveyor. Again, the CSW Checkweigher saves plant floor space by rejecting off the same conveyor that is used for weighing. Both right hand and left-hand reject mechanisms are available. Industrial Design – The patented “Lifting Weigh Platform” allows the product to be weighed without weighing the entire conveyor. This protects the load cells from damage caused by excessive weight or force being applied to the conveyor and produces highly accurate results. Industrial conveyor components are used without regard to their weight. Standard Controls – The CSW Series Checkweigher is controlled by industry standard PLCs instead of proprietary digital control boards. Most plant maintenance technicians are familiar with PLCs, so minimum training is required. The CSW Series Checkweigher easily interfaces with external devices such as bar code scanners and printers through RS-232, Ethernet, or other PLC communication protocols. Compact Footprint – All functions of the CSW Series Checkweigher — including Next Case Holdback, Weighing, and Reject — occur in a very compact footprint. 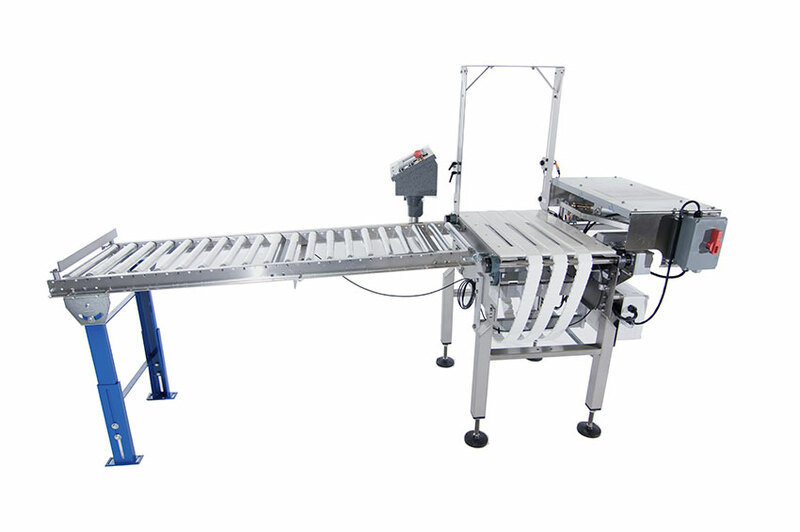 With the CSW Series Checkweigher, there is no need for an additional sequencing or reject conveyor which would add considerable overall length to the line.